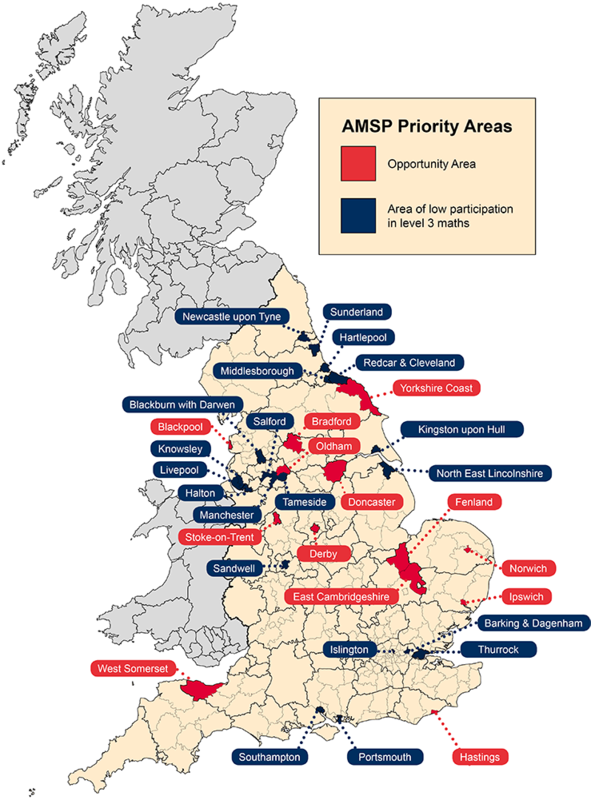 The AMSP provides additional support for state-funded schools and colleges in parts of England that have been identified as AMSP Priority Areas. These schools and colleges can access tailored support from their local AMSP Area Coordinator to assist with developing and implementing a plan to improve their advanced maths provision and participation. In addition, eligible schools and colleges can receive subsidies towards travel costs, courses fees and cover costs help them to take part in professional development and student enrichment activities provided by the AMSP. The AMSP Priority Areas include the DfE’s 12 Opportunity Areas and the 20 local authorities with the lowest proportion of 16-19 students participating in advanced maths. If you work at a state-funded school or colleges that’s located in an AMSP Priority Area, please get in touch with your local AMSP Area Coordinator. You can find their contact details by selecting your region below.